Known by the scientific name Hylocereus undatus, Dragon Fruit comes from various different types of cactus species that occur naturally in Mexico, Central America and South America, and are grown in many Southeast Asian countries such as Thailand, Indonesia, Malaysia and Vietnam. In recent years global demand for Dragon Fruit has continued to rise and therefore farming of the fruit has increased including in the United States. 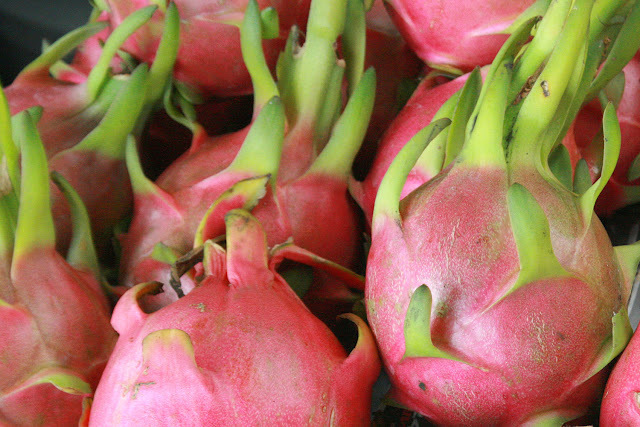 Though Thailand and Vietnam remain the top suppliers of Dragon Fruit worldwide. While Dragon Fruit is considered to be a super food, it has yet to receive the degree of publicity that other super foods have in recent years. Dragon Fruit should top the list of super foods however, as it contains antioxidants, fiber, large quantities of vitamin C, B1, B2, B3, iron, calcium, and phosphorus, and has been reported to contain anti-inflammatory properties. At our restaurants Dragon Fruit is a common ingredient to fruit salad dishes and fruit smoothies. Also Dragon Fruit is easy to peel and quick to digest, making it a perfect snack anytime throughout the day or evening. Dragon Fruit is great for preventing dehydration in hot climates, as it contains 90% water. In addition to the two popular types of Dragon Fruit found in Thailand, several other types exist in various parts of the world including pink and yellow colored versions. Next time you see the odd looking magenta colored fruit at the market, think again before moving on. This special fruit with its long history in both the Western and Eastern hemispheres might just be a great new healthy addition to your diet. All of those in the NYC area who are fans of May Kaidee recipes are in luck. Throughout the month of August May will be offering private cooking classes, demonstrations and ingredient tours in Chinatown. Please check out the Kickstarter campaign for more information.